Let’s try this again shall we... One sure-fire way to get me to import an anime in which I’m interested, is to have Kazé release it in the UK. I’ve managed to pick nits with every one of their releases here so far, and most of them have been so technically inferior that they detract from the viewing experience. 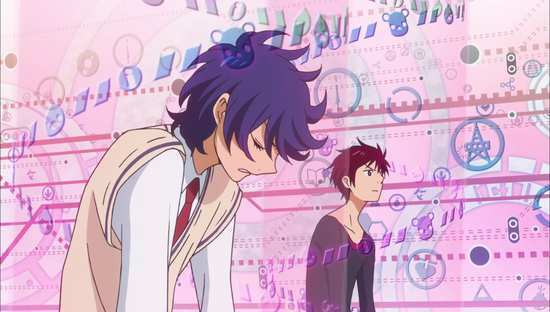 Mawaru Penguindrum, coming from Kunihiko Inuhara, the director of Revolutionary Girl Utena, was a show that I was obscenely eager to watch, but when it came to the UK release, the fact that it was DVD only was less of a disappointment than the fact that it was woefully subtitled. It was bad enough that I eventually passed on reviewing part 2 altogether, certain that my vitriol for its technical issues would overwhelm any critical analysis of the show. ... And then comes back to life. A strange force has extended her life, and possesses her body when she wears the penguin hat. 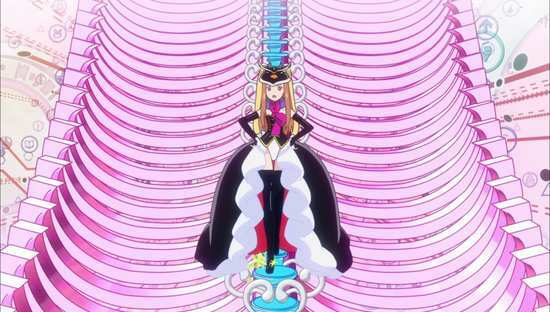 It promises to extend her life even further if Kanbe and Shoma will find for it the mysterious Penguindrum. To help, it sends three penguins, penguins that no one else can see. The twins keep being sent on missions that will hopefully help them locate the Penguindrum, but no one knows what the Penguindrum looks like, and their three penguin helpers are more hindrance then help. 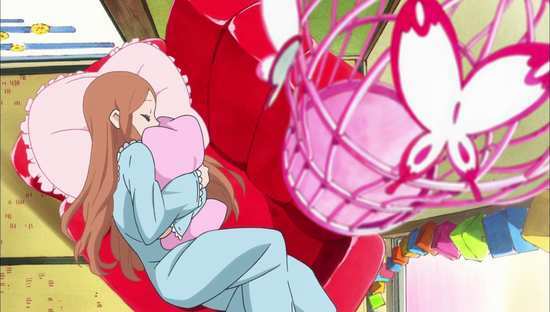 The first half of Mawaru Penguindrum is presented across two dual layer Blu-ray discs. And yes, it turns out that Kazé even used different translations for the episode titles! Mawaru Penguindrum gets a 1.78:1 widescreen transfer at 1080i resolution, played back at 60Hz. If you want 1080p learn to speak Japanese, or Italian, as apparently Dynit’s Italian release is progressive. For English speaking territories we have to make do with interlaced. Sentai Visual’s US release picked up a fair few complaints in terms of image quality. 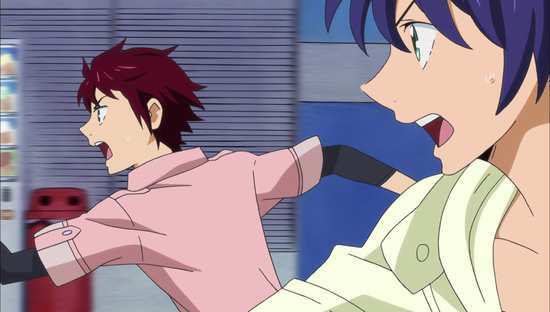 They did the usual 9-3 episode split on one dual and one single layer BD. Combing artefacts were apparent, colours were washed out, and there was heavy compression in the more animated scenes. Consequently, Siren Visual re-authored the discs from scratch, opting for a 6-6 episode split on two dual layer BDs, compromising the audio and shifting the extras to hopefully max out the bitrate for the video. If you want to take a look at some comparison screen shots, this Fandom Post forum entry offers some tantalising links. The image looks pretty good on the Siren release. It’s clear and sharp throughout, detail levels are excellent, colour reproduction is robust and vivid, and the show’s retina challenging colour scheme comes across to excellent effect. 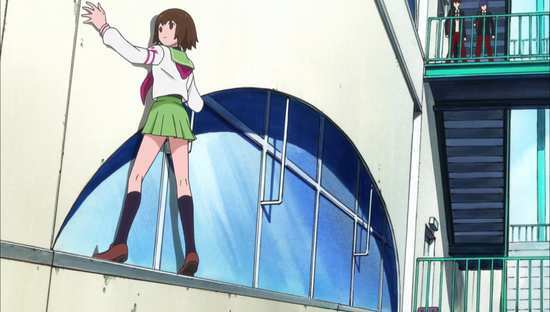 While the character designs may be a little generic, the animation most certainly isn’t, with studio Brain’s Base taking a page from Shaft’s book in bringing a whole lot of imagination and variety to the screen. If there are signs of the interlaced format, they would be the combing artefacts on the subtitles, and a slight judder to pans and scrolls, not quite as smooth as a progressive disc would have allowed for. As usual, it’s the Survival Tactic sequences that offer the most challenge to encoders, with a whole lot going on in the image, a lot of fast motion and complex animation, and while the horrendous artefacting of the Sentai release isn’t here, you can’t get away from some mosquito noise around fast motion. You’ll have to pause the disc and get up close to the screen to see what I mean. There’s also the slightest hint of digital banding in darker scenes. In terms of audio, you get what is flagged up as a DTS-HD MA 2.0 Stereo Japanese track, but as my player’s bitrate meter never varied from 1.5Mb per second, I’m more inclined to believe it’s a PCM track instead. The English stereo isn’t the lossless track of the US release; rather it’s a DD 2.0 stereo track at 0.4Mb per second. 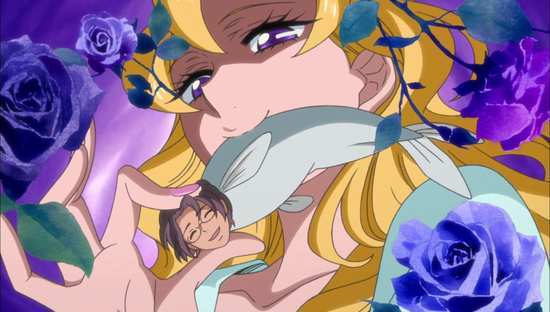 If you’ve read my review of the Kazé release, you’ll know what I think of the dub, and won’t be surprised that I stuck with the original Japanese audio for the duration, and Penguindrum certainly sounds good in its HD form. The dialogue is clear, and the music, action, and ambience to the show gets a nice bit of space courtesy of the stereo. This being the Blu-ray, there are no issues of pitch correction to deal with. You get two discs in an Amaray style Blu-ray case, with a central hinged panel. If you don’t like the whopping great Australian ratings logos, the sleeve is reversible, but Siren have neglected to put the show’s title on the inner spine. The discs present their content with animated menus. They’re not the best authored discs in the world. Navigating them means that sometimes an option that you highlight and then move away from, stays highlighted after you leave it. And on one occasion when I was changing the audio, the menu just froze on me, requiring me to restart the disc. This being a Siren release, the default on insertion is Japanese with English subtitles, which saves me from risking a disc freeze if I just go straight to the episode. Also, like a lot of Kazé discs, starting a new episode often results in the sound dropping out for a second on my Panasonic player, easily resolved by just skipping back and starting again. There are no extra features with this release. And while Sentai are apt to put a translated English language credit scroll after each episode, this Siren release omits those, and you’ll have to go to ANN’s Encyclopaedia to see just who did what on this animation. 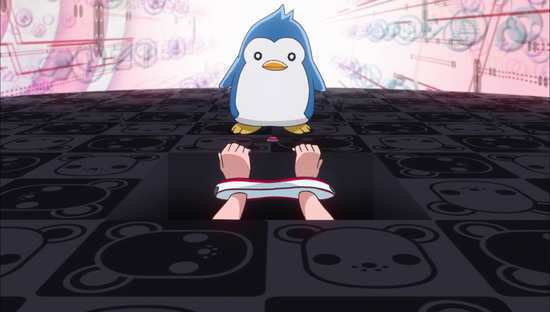 Now is the time to keep it brief, because this review can’t do Mawaru Penguindrum justice. Just as I suspected from a Kunihiko Inuhara creation, this is dense, esoteric, complex and multi-layered. Watching it just once is no way to truly comprehend it, and watching it for a review, with pen and pad at hand, and keeping an eye out for technical issues as well as evaluating the content, is going to result in an even less satisfying appraisal of the show. Add to that, this is just part 1 of the series, and following an in at the deep end beginning, the story hoards its secrets assiduously, giving with one hand and taking with the other, demanding that the viewer work at comprehending it, rather than dishing out its narrative on a plate. By the end of this half of the series, the pieces are only just beginning to come together, only the broadest outlines of the overall picture are revealed, and after the initial confusion, you might just get a tinge of satisfaction, the impression that you might just have figured out where this series is going. 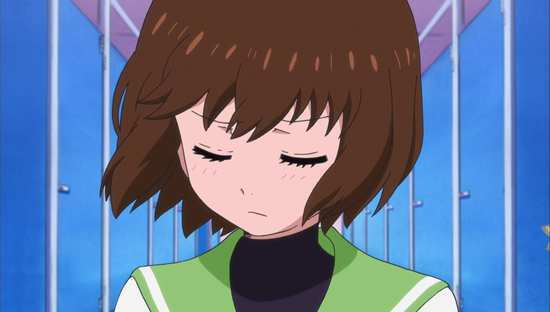 Of course the next episode may just turn up and prove you wrong, but this is really one series that needs to be judged in its entirety, not by halves, and certainly not piecemeal. The narrative is fairly easy to grasp. Himari Takakura, little sister and apple of her brothers’ eyes is terminally ill, dies, and then comes back to life courtesy of a novelty penguin hat. Possessed by a mysterious personality, she demands that the twins find something called a Penguindrum, in exchange for permanently saving Himari’s life. 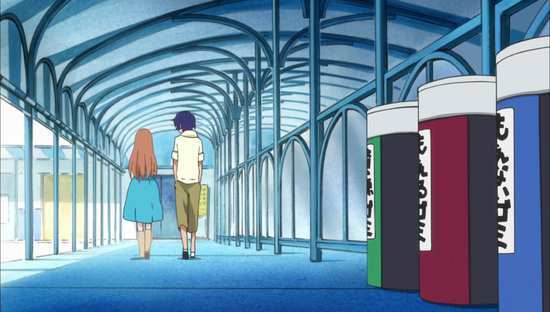 So it is that each episode, the brothers will be pulled into an alternate reality where Himari (plus hat) will reveal the latest ‘Survival Tactic’, the next mission that will take them closer to finding the Penguindrum. So far so surreal. 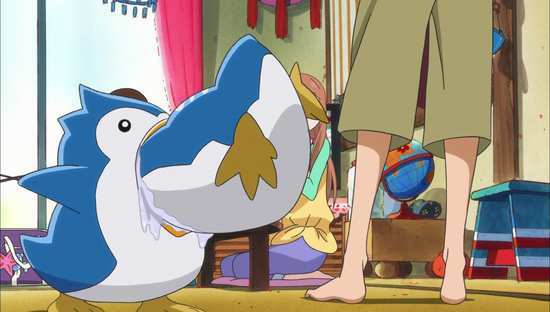 No one actually knows what the Penguindrum is, and they get three ‘invisible’ penguin helpers to assist them on these missions, all somehow reflecting the siblings’ differing personalities. The first Survival Tactic is to obtain a certain diary from a schoolgirl named Ringo Oginome. First they have to shadow her, search her possessions, and then get closer to her. 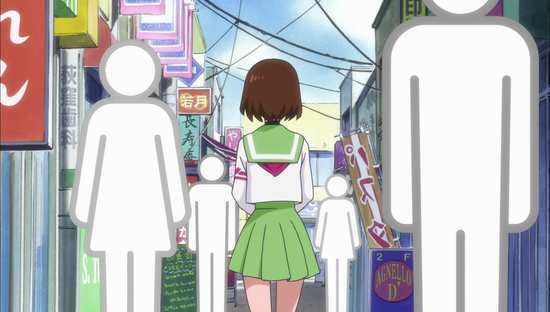 She seems like an ordinary schoolgirl at first, but quickly reveals a darker, more worrying side. She’s a stalker, a girl in love with the boy that tutored her when she was younger. 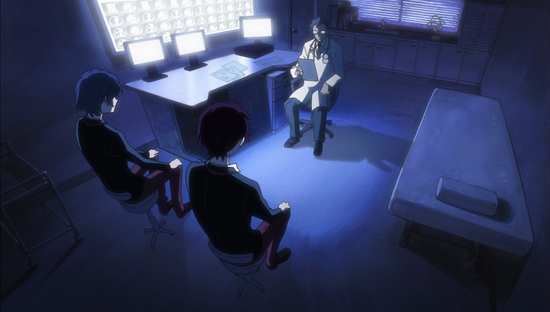 Now Tabuki is a schoolteacher, Kanba and Shoma’s teacher to be exact, which makes things complex. Ringo’s obsessed to the point that she spends her nights camped out under Tabuki’s apartment, and it soon turns out that her plan to seduce him is carefully documented in the diary that the brothers need. 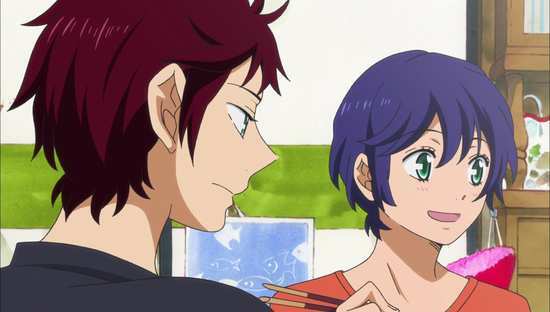 She isn’t beyond enlisting Shoma’s aid in breaking Tabuki up from Yuri, the actress he is engaged to, and getting him to fall for her instead, with the promise of the diary. But things are never that easy. 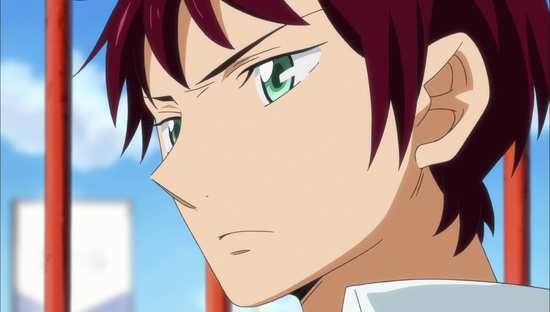 It turns out that there are other people after the Penguindrum, other factions involved in all this. 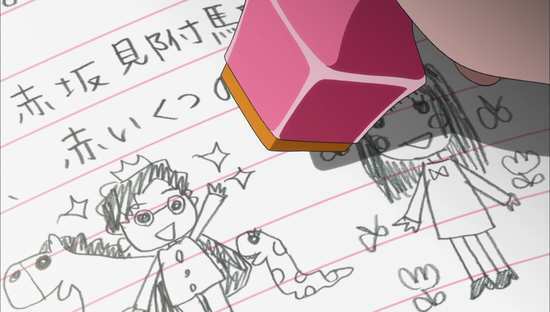 Another girl named Natsume is going around with a penguin helper of her own, erasing the memories of Kanba’s old girlfriends, while trying to get the diary for herself. Himari isn’t the only one who issues Survival Tactics when she puts on a novelty penguin hat, and a librarian named Sanetoshi Watase has an interest in Himari and a part to play in this. The characters are only placed on the board at this point, and how they will play the game is yet to be seen. One thing does become clear, these aren’t just random characters, they have intertwined and unexpected destinies, as well as a shared past that are only just touched on as this half of the series concludes. It also becomes clear that the conflict between fate and free will has significance in the story, and how that manifests is yet to be revealed. 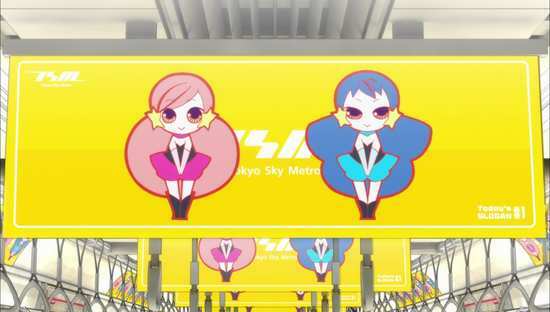 Mawaru Penguindrum is art expressed as anime. You can’t judge whether this is a masterpiece or pretentious folly just by watching half of it alone, and the answer to whether it is a masterpiece or not will be different for everyone that watches it. Indeed just what this show means, what lies under its story will also differ depending on the viewer. 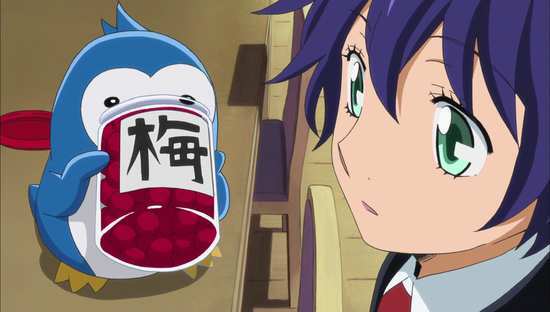 Beneath its anime conventions lies complexity and layering that you have to think about, unravel, contemplate and mull over. This is a show where everything means something, or can be made to mean something by the viewer. The imagery, the camera angles, the dialogue, the artwork, it is all weighted with intent and meaning. 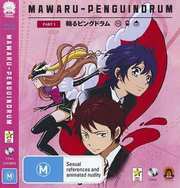 Is Mawaru Penguindrum worth buying? Ask me after I’ve seen part 2. I had every expectation that this Blu-ray release would be a major improvement over Kazé’s DVD release, and sure enough it is. You get to see the whole picture now, courtesy of decent subtitling and translation. That’s more than enough to nudge the overall grade up a tad. Only I have to nudge it back down again. 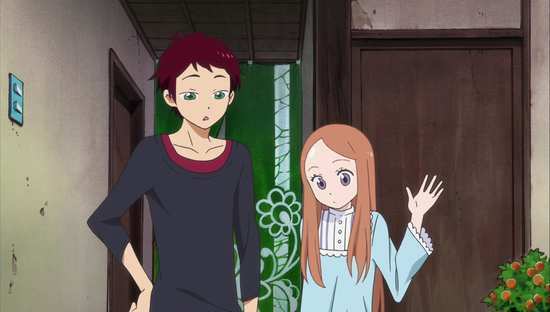 Perhaps it’s because it’s only been a year since I last saw Penguindrum Part 1, but I found its blending of childish antics with adult themes to be a little tedious this time. Perhaps it’s because familiarity breeds contempt. It’s hard to get enthused about a story like Penguindrum’s when you know ahead of time what big twists and turns are coming. I realise now that this show is what in live action I term ‘event TV’. They’re the shows like 24, Jericho, and nu-Doctor Who, which hit big with spectacle, melodrama, action, and intensity, but often suffer from weak narratives and long term emotional investment. They’re the kind of shows that you tune in religiously for when broadcast, have the full watercooler experience with them, but should you ever have the opportunity to re-watch them, you realise just how weak they are, how scientifically they are designed to evoke the required endorphin rush when the ‘events’ are first encountered, but fail to provide the same hit the second time around. 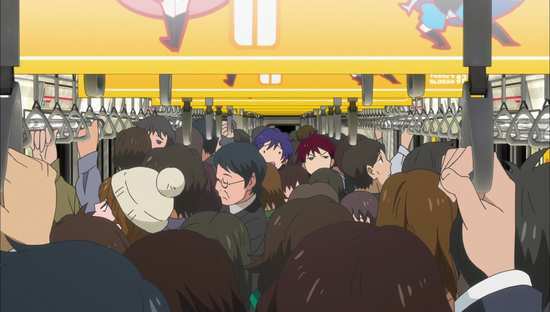 I got the exact same feel from my second viewing of Penguindrum Part 1. Of course that bodes well for Part 2, as I have never seen that before. But re-watch value is going to be an issue with this show, and I can well see myself leaving a good few years before trying it again. But, despite the clumsy subtitling and creaky disc authoring, this is the version to go for.